Why is Thanksgiving one of our favorite holidays? Because we're all so grateful for our families and friends? That we have a roof over our heads and food on the table? Hell no. It's because you don't have to buy gifts for anyone, over eating is expected, plus football is on if you're sick of talking to your relatives. And I don't know about you, but in my family, we have a little of everything - I literally sit between a MAGA and a Never Trumper. There are a couple of grandparents (on both sides) who will say the most inappropriate but hilarious things (I've heard a "conception story" - several times - of a baby who is now in her mid 40s...), there are young adults who celebrated Thanksgiving the night before (one of the reasons we eat around 3 o'clock), sullen teenagers, pre-teens who are by far the best behaved in the group, younger kids who traditionally touch every crescent roll, if we're lucky, at least one baby and a toddler throwing tantrums (while parents of older kids reminisce about how much easier it was back then, because toddlers don't have cell phones - yet). Oh, and at least one spoiled dog. Kathy started a tradition years ago where each kid has to make a side dish, and that lives on, as does the boys fight for the easiest (frozen corn in the microwave?) . I love to get up early and cook the turkey (the secret is to fill the bottom pan with water and spices, to keep it moist). I try to cook it slowly, but it's always done early, but that's ok. Because once it's done, I just enjoy the chaos. And grace always ends with an enthusiastic "God bless the cooks!" 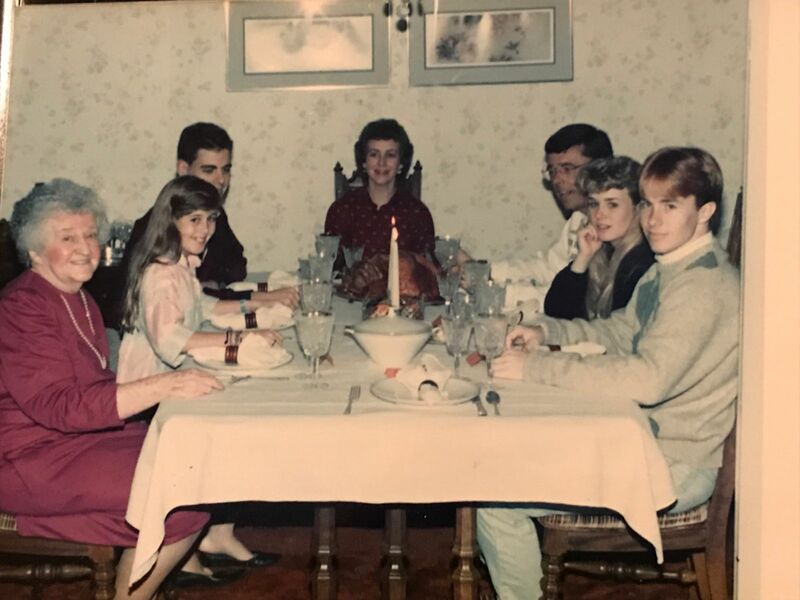 Here's a picture of my family enjoying a Thanksgiving with my grandmother in the 80s. I'm on the left, partially obscured by the favorite child. A cool fact: the back of the photo says it was taken by my uncle, my mom's brother Fred Lowery, who fought in 3 wars - World War 2, Korea and Vietnam. He later founded a successful business running high end full service day care schools (not much different than the Army), and still goes to work every day. Fred just celebrated his 92nd birthday.